Story: Roman is the ruler of an aquatic race living in the city Neuport, situated somewhere at the bottom of the sea, presumably the Pacific. During WWII, Roman joined the Allies against the threat from Hitler's forces, but left after a short while after repeated personal clashes with Super-Patriot . Apparently Roman didn't loose contact with the surface world. From 1960-67 there was a group called Allied Supermen of America which Roman was a part of (e.g. ). The extent of his involvement and what happened until his next appearance in 1993 has not been revealed. In 1993 he contacted his old comrade-in-arms Battlestone in order to get some help . Having reestablished the contact with the surface world, he continued to participate in Brigade's missions, ending up in joining Brigade in it's third incarnation . Roman was last seen as a part of Supreme's newly formed Allies . Skills & abilities: Roman's physical strength is superior to normal men, but the magnitude is unknown. He also posses the ability to breathe under water. Like his strength this is a part of his genetic makeup. He also has the ability to fly, which seems to be an ability which normal Atlanteans haven't got. Background notes: Roman is clearly inspired by Marvel's character Namor, from his powers down to Roman being Namor in reverse. 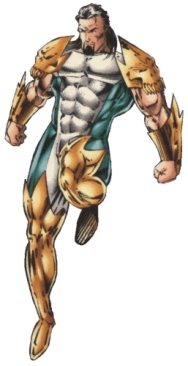 His design is different from Namor, but must be considered a typical Liefeld creation with the bracers, shoulder plates and massive muscular physique. He participated in a lot of stories but as a character he was never fleshed out and given some depth. Aquaman: DC Comics take on a ruler of Atlantis. Namor: Marvel Comics take on a ruler of Atlantis. Poseidon: The ruler of the sea in the Greek mythology.